I like to keep Beef Jerky around as an emergency snack when traveling, or if I just run out of gas in the afternoon. It’s a nice portable, high protein snack. The problem is that most beef jerky contains gluten, soy, sugar or other unidentifiable compounds. 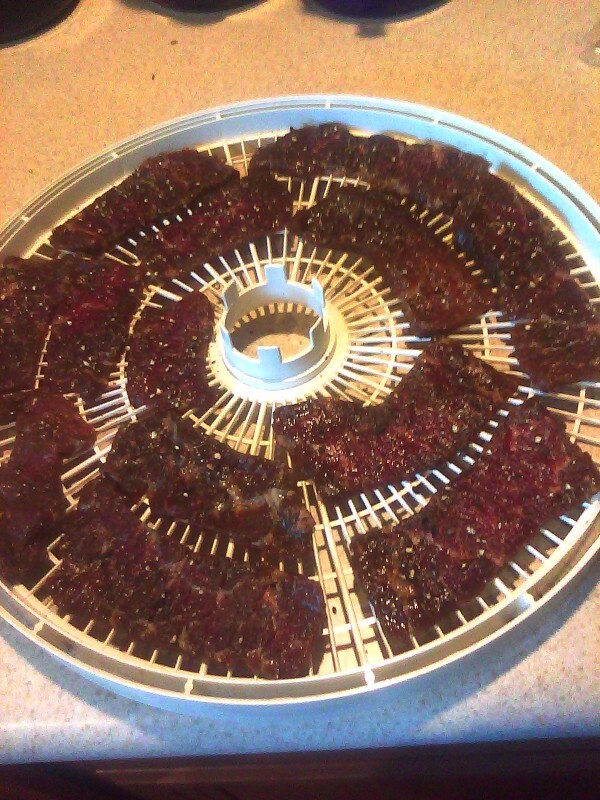 These are all substances that I am trying to avoid, so I decided to try making beef jerky with our dehydrator. I purchased a nice looking, grass fed London Broil that was locally raised. It weighed 1.9 lbs. 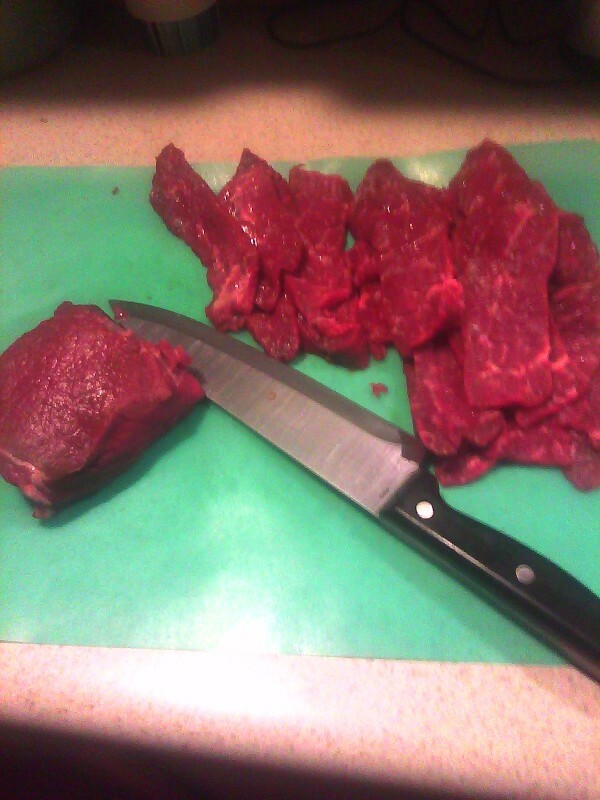 First, I sliced the London Broil as thinly as I could against the grain. 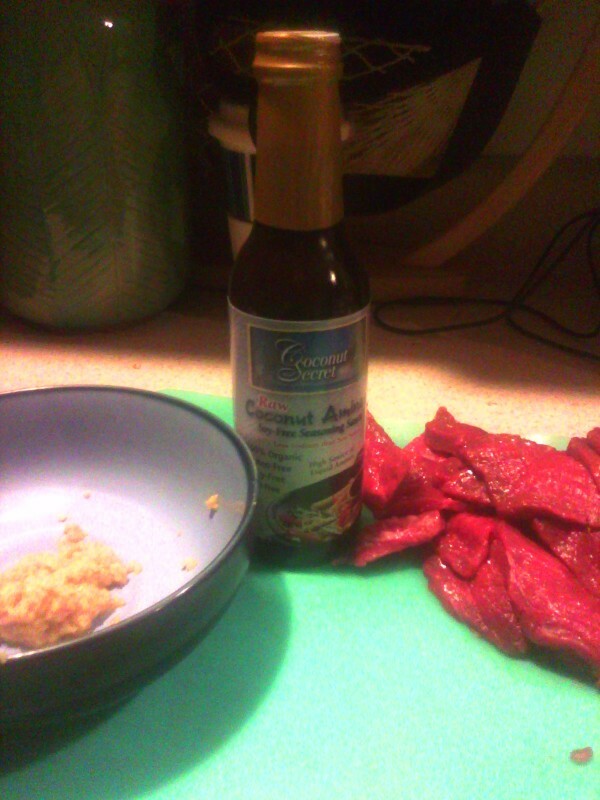 Once that was done, I prepared a marinade using 1 cup coconut aminos and 3-4 cloves of minced garlic. I let the meat marinate in the refrigerator for 24 hours. Then I laid it out on the dehydrator trays. Pat the pieces dry before laying on the trays. Make sure nothing is overlapping. I like Peppered Beef Jerky, so I coarsely ground black pepper over all the meat before drying. I had enough meat to load 4 of the dehydrator trays. Once all the trays were loaded, they went into the dehydrator at the highest setting (145 F) to dry. 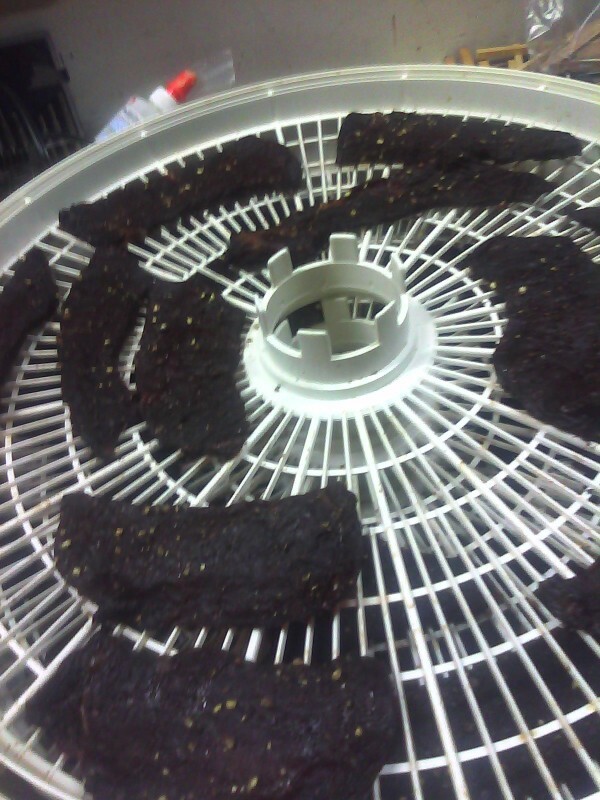 After 2 1/2 hours I opened up the dehydrator and checked the meat to see how it was doing. I removed all the pieces that were dry. 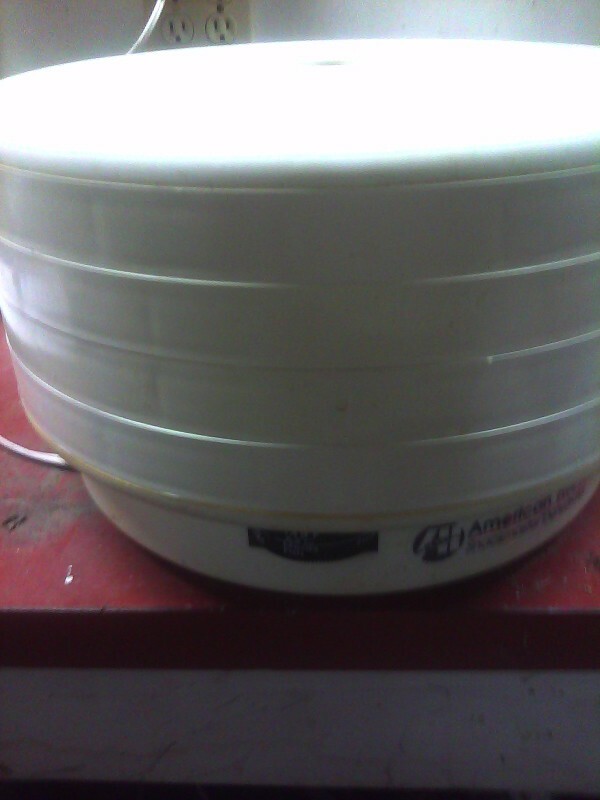 I continued to check every 20-30 minutes until all of the meat was dry. It took about 4 hours for all the meat to finish drying. 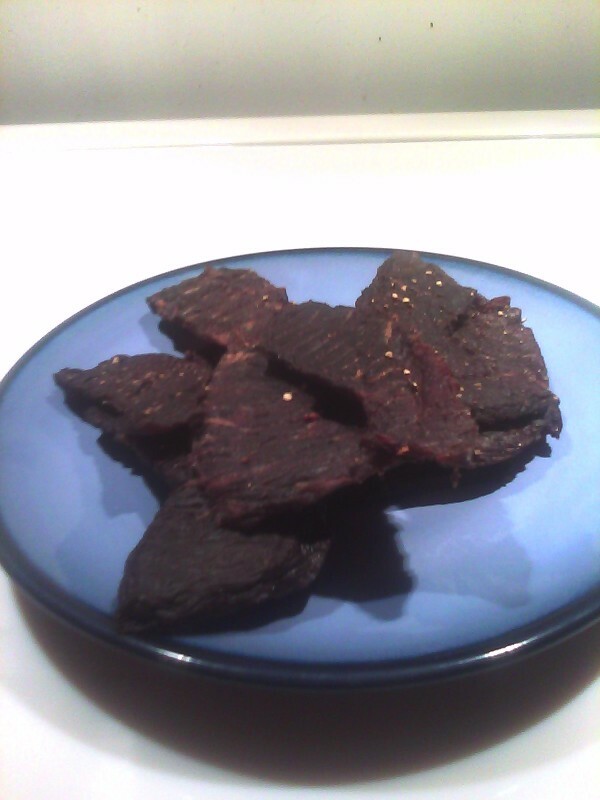 The finished beef jerky weighed 1 pound. This Beef Jerky tastes FABULOUS! I have been spoiled. I will never be able to go back to store bought beef jerky. TMOTH (The Man of the House) is pleased that I have found another use for the dehydrator. It’s generally been an under-utilized piece of equipment at our house. This entry was posted in Recipes and tagged Cooking, Paleo, Recipe. Bookmark the permalink.